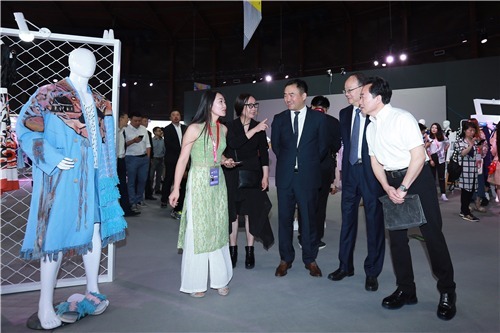 The innovation of this year's fashion week is combination of "special activities". 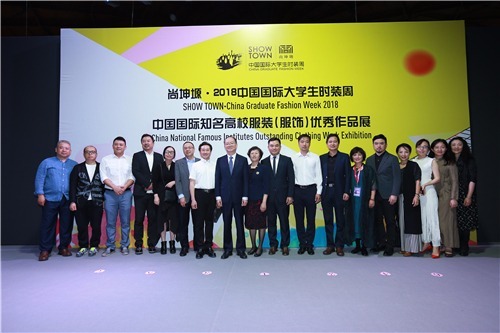 Besides common graduation works show, the fashion week also innovated and extended special activities, by holding 2018 China International Exhibition of Excellent Works from Well-known Colleges and Universities for the first time. 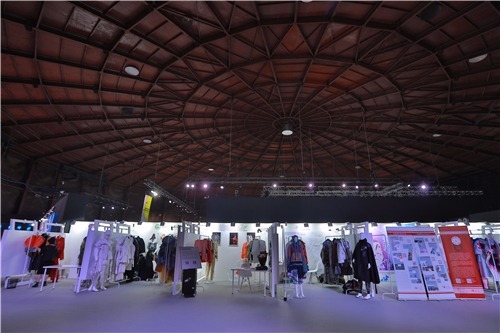 From 35 colleges and universities both at home and abroad, 978 sets of excellent clothing and 57 pieces of fashion accessories were presented at 79 Tank, 751 D•PARK which is full of artistic atmosphere, completely revealing the creative concept and ideas of the new generation of Chinese fashion designers. In addition to domestic colleges and universities, the London College of Fashion and Central Saint Martins College of Art and Design, the UK, which both are famous domestically and internationally, also participated with their outstanding graduation works so as to conduct discussion and exchange on the platform provided by the China Graduate Fashion Week and help a new millennial generation of fashion designers rise. During the fashion week this year, the China Fashion Association (CFA) cooperated with well-known fashion agencies at home and abroad such as 751 D·PARK, GRIMMBRO, Guangzhou HuiMei Fashion Group, and Saga Furs to plan and hold a series of promotion conferences, exchange meetings of colleges and universities, dialogues with designers, through-train between colleges and enterprise, “Bag· Fun”, and other related interesting activities, to focus on the industrial development and innovation and strengthen the contact among professional colleges and universities, enterprises, and fashion institutions. Among them, “Bag· Fun” Chinese Original Designers' Bags Showroom and "You are the Barbie!" Experience Area will be open to the public at 751 Fashion Echo First Floor, 751D•PARK. 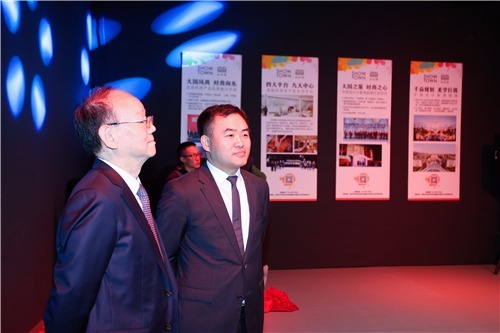 In addition, the design competition, professional selection and DHUB will be also held concurrently. The selection event of high-profile 23rd China Fashion New Design Award will present a grand awarding ceremony, to grand the China Fashion Design Education Award, Excellent Teacher Award, New Design Award, and other annual awards to those winning schools, teachers and students. 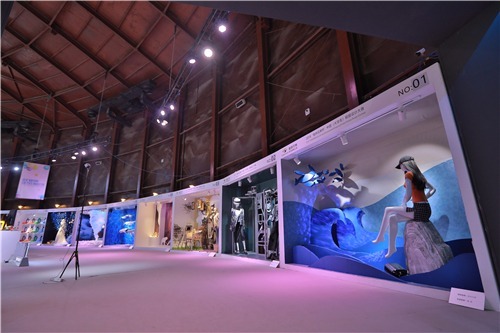 2018 “GRIMMBRO Cup” China (Undergraduate) Shopping Window Display Design Contest was launched and set up special exhibition at the designated area at 79 Tank. At the end of this fashion week, such awards as Men's Fashion Design Award, Women's Fashion Design Award, and Style & Innovation Awards will be announced and granted at the grand award-giving ceremony. Through the selection and awards, a bridge will be built to allow graduates to enter the market successfully and promote the continuous improvement and perfection of talent education in the universities and colleges. 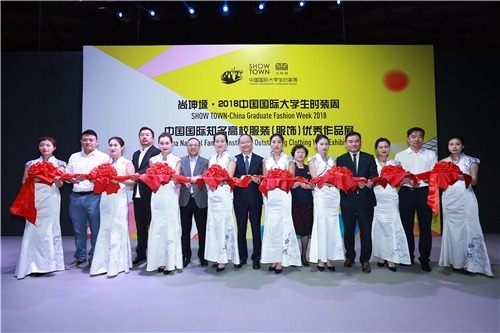 With the help of SHOW TOWN, 751 D•PARK, and other high-quality resources in the industry, the China Graduate Fashion Week is working to promote the development of the Chinese fashion and creative industry. 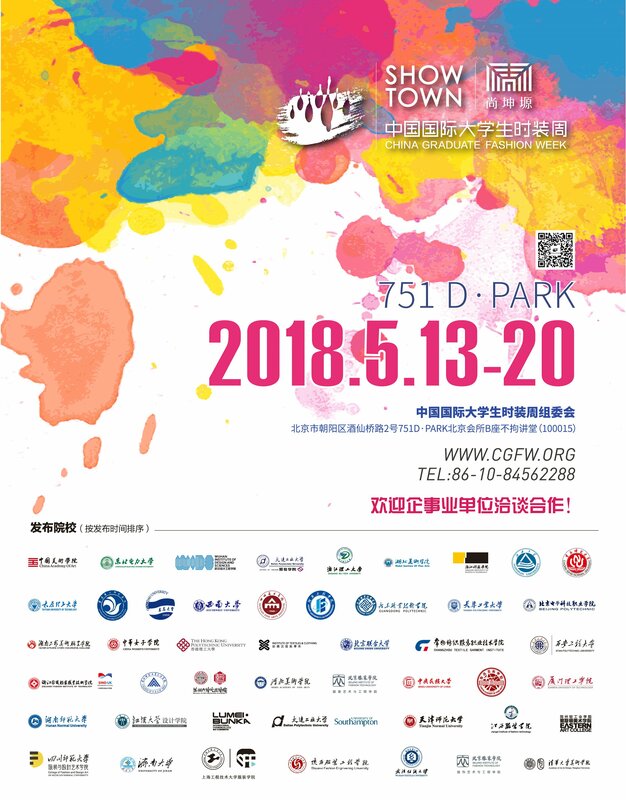 As the exclusive naming supporter for three consecutive years of 2016, 2017 and 2018, SHOW TOWN continued its consistent training and support for China's new generation of original fashion designers this year, embodying its corporate responsibility to promote the development of the Chinese fashion industry. With the activity brand of China Graduate Fashion Week getting mature increasingly, 751 D•PARK has also become a nationwide well-known cultural and creative fashion industry park by relying on its own industrial advantages in software and hardware and actively promoting the benign development of the fashion industry, so as to provide new designers with a healthy and sustainable growth space. Over the past five years, the China Graduate Fashion Week has contributed countless new generation design and business talents to the creative fashion design industry in Beijing and even China, many of whom have become the leaders and backbone in the industry. A series of activities of this year, as exchange and interaction among production, teaching and research institutions at a deeper level, will promote the linkage between design graduates’ career starting point and industry as well as the seamless joint between talent cultivation in universities and colleges and market demand, thus realizing the dream of a textile power and also practical and strategic significance of the strategy of reinvigorating China through talents. 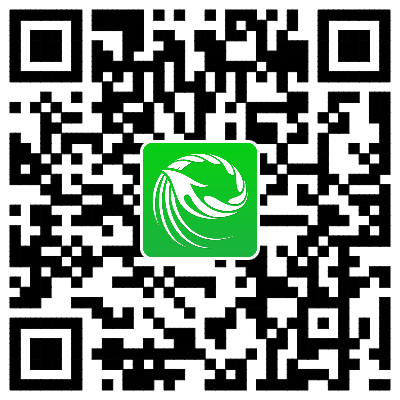 We understand that the China Graduate Fashion Week may survive to last only when the branding is realized. 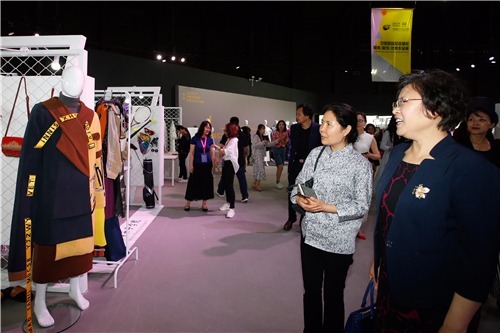 The China Graduate Fashion Week is integrating into the big context of the global fashion industry and also providing opportunities for more and more young designers. As a fashion design exchange activity among colleges and universities, it not only provides a new window for students majoring in fashion design to move towards the society, but also creates good opportunities for the future talent selection in the fashion design industry and for fashion enterprises to introduce design talents in a more direct and more efficient way. 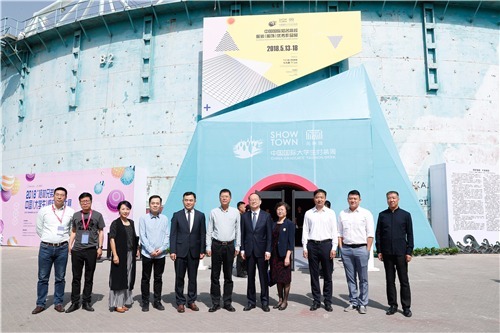 On the road drawing the blueprint for the future, the China Graduate Fashion Week will be revitalized with a new look and this implies that a more ambitious and long-term brand journey will be started.